Back to school season is in full swing as the major retailers are rolling out their great back to school deals. In 2017 the National Retail Federation expects both K-12 and college back to school spending to reach $83.6 billion. However, not all items should be purchased at retail stores. Even after the discounts and sales, whether shopping for a single child or several children, back to school demands can put a serious strain on any household budget. Below are a few items that you should shop for at your local thrift stores now to save some cash as the back to school shopping season begins. Buying jeans at a thrift shop can save your back to school budget a lot of money. Buying jeans at a thrift store can save your wallet or purse from taking a big hit. Depending upon a store’s pricing policy and brand selection available you could save up to 90% on a pair of jeans. Yes, that $100 pair of designer jeans really did say $9.95 that you found in the back of the clothing rack. So why would you want to pay top retail dollar for something your growing children will outgrow soon when you can find it for much less at a thrift store? Speaking of growing children and pricey clothing, uniforms can run the gamut in costs. Some schools have simple uniform requirements and other schools with more complex requirements that can quickly run up your back to school clothing budget. Again this is a situation why would you want to pay top dollar for something your child is going to outgrow fast? Hitting your local thrift stores and doing some digging on the racks you can find additional savings. If your child’s school has specific requirements be sure to hit up the thrift stores within the school’s service area to find uniform pieces that have been donated by previous families who had children attend that school. Yard sales in the area, while may not be the most efficient, can be another source for potential school uniform pieces. Thrift stores can be a treasure trove for offbeat office supplies. Office supplies and art supplies are something you will more than likely have to buy most items new from retail or discount retailers. However, some things such as staplers, hole punches, binders, specialty rulers, paper cutters, and other odd supplies can sometimes be found at heavily discounted prices. I almost exclusively buy binders that have seen little to no use from thrift stores and yard sales for 25 cents to a dollar that normally range from $2 to $8 or more at an office supply store. 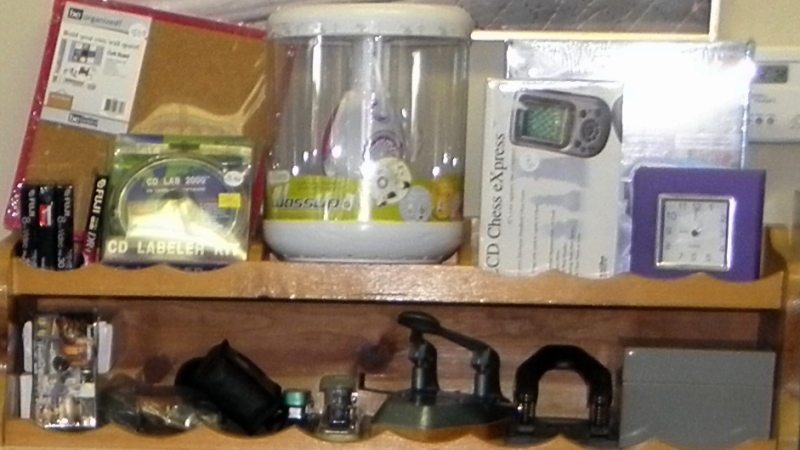 When I want to purchase a special office supply item such as a 2 ring hole punch, I start watching the thrift stores. More often than not, I find the item at a fair price before my want turns in a need. When purchasing items that cut or punch holes into paper, check to make sure the equipment has all safety features and sharp blades that are undamaged. 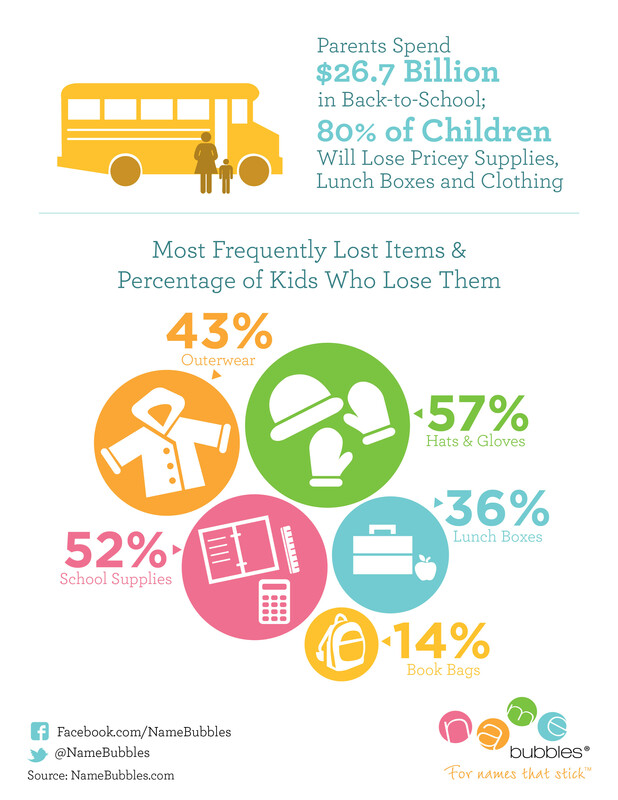 School supplies are the second most lost item according to NameBubbles.com. Of the parents surveyed 52% of the children have lost some sort of school supply. Pencils and erasers while they do cost money, are cheaper in most cases to replace at retail over a binder or hole punch. The more supplies you buy at discount from thrift stores, the less pain your wallet will be reminded of if you have to repurchase those items after your child loses them. NameBubbles.com most frequently lost items and percentage of kids who lose them. Lunchware is a necessity for the parents who pack their children lunches. The world of lunchware products is vast with prices ranging from the cheap and disposable to the expensive and reusable. Cheap and disposable may be very appealing, but the costs can add up over time, not including the environmental costs with the added trash. Expensive and reusable is nice because these products tend to be very durable. But, who wants to spend a lot of money on something that according to NameBubbles.com of the most frequently lost items 36% of kids will lose their lunch box. I have found that most thrift stores will have various pieces of lunchware at very reasonable prices. I have picked up various containers of all shapes and sizes, with lids, for almost any type of meal I would ever take with me for lunch. I have also found top name brand lunch bags with thermal liners to help keep food cold at heavily discounted prices. In most cases, the lunch bag containers have very minor blemishes or are a model from a few years back that someone purchased, never used, and then donated to the thrift store. College students heading off to school or even getting their own place for the first time can save a bundle at thrift stores. Quality dishes, glasses, pots, pans, and sometimes utensils can be found at a fraction of retail. There will also be times where you can find vintage pieces that are both unique and functional. This is an excellent way to get starter kitchen items for a mere fraction of retail. If your child is into sports, then you already know how fast those costs can add up. Not all sports gear will be available at thrift stores, but any that is available will more than likely be heavily discounted down when compared to its retail counterpart. When looking at used sporting gear be sure to thoroughly examine each item for damage or missing items that can affect the safety or performance of the equipment. Bicycle helmets should never be purchased used from any source. While the helmet may appear to be fine it could have already been damaged in a previous crash and might not be able to endure another crash. 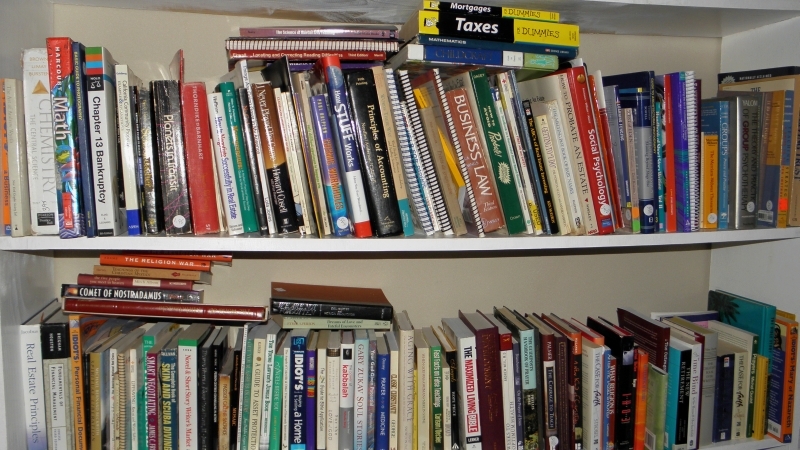 Books are usually in abundance at thrift stores for reasonable prices. Books have been around since at least 2400 BC and even though we live in the digital age, books will remain for some time to come. Most thrift stores have a book selection. In some cases, it may be a single shelf, in other cases a large area with several aisles or shelves. For me, I still love reading from physical books. While the e-reader is great for light weight travel and quick on the go, physical books I find so much more convenient. When doing a book report it is easy to mark pages and jot down notes in the margins. In college, if I found the course’s designated textbook to be difficult to understand I would hit up the local thrift stores and find other books on the same subject to help me out. Book pricing tends to be very reasonable at thrift stores with most book prices under a few dollars. When comparing the digital costs of a book off the major retail sites, that $4.95 digital download may only cost you 50 cents for the physical copy at a thrift store. Backpacks are a must for any student. After all, no one wants pockets full of pencils and pens while carrying all their books, binders, tablet or laptop, and other items. At thrift stores, you can find your child a stylish retro backpack. You can also look for long strapped bags to use as a cross body bag to hold your child’s gear. Oversized leather bags make for great book bags. A dirty looking leather bag or one with minor scuffs can be cleaned up using spray furniture polish. For those concerned with fashion, brown and black bags tend to go with most outfits. So your kids have their nice school outfits or uniforms and it is 10 minutes after school ended. Naturally, you hope they will keep their school clothes nice, but kids are kids. Thrift stores are an endless year round supply of cheap after school, weekend work, playing in the dirt, don’t have to worry about what happens to my clothes. For just a few dollars you can get shirts and shorts for your child so they can just be kids in these clothes and not worry about damaging their nice school clothes. 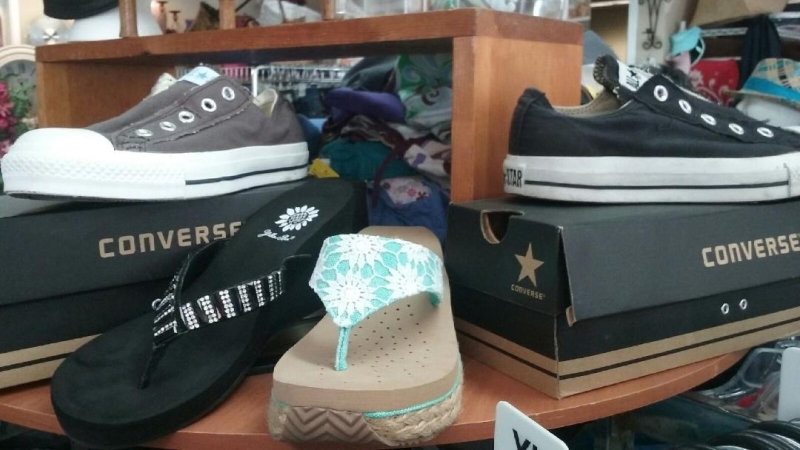 Name brand shoes and unique retro shoes can be found at thrift stores. When I was growing up, I remember constantly outgrowing or wearing out my shoes and my mother taking me to discount retail stores to get new pairs. Nowadays you can find high-end brands or a fashionable retro pair of shoes at thrift stores. A good pair of after school thrift store sneakers can help reduce wear and tear on your child’s school shoes keeping them nice for the classroom. Remember to shop outside the usually sizes too. Extra small and small adult can work for older children. Sometimes the item one size too big was shrunk a bit in the wash and would fit your child perfectly. Check both men’s and women’s clothing racks as some clothing is not gender specific such as t-shirts, sweaters, and hoodies. Thrift stores are run by people and people make mistakes and will place clothing in the wrong size section. It never hurts to do a quick search and no telling what vintage or name brand article of clothing you may find for your child. These are my tips for thrift store savings for the 2017 back to school shopping season at thrift stores. When I was younger it was still somewhat taboo to buy things at discount or thrift stores. People still bragged about how much they spent on their things. Nowadays we brag about how much we saved. Thrift stores are one of your best friends in your quest for savings. Also shopping at thrift stores gives items that would end up being thrown away a second chance in your home helping the environment in the process. In addition, most thrift stores tend to support charities and nonprofits, so the money you spend will help out causes in your community. I don’t know about you, but I am always excited to save money! Let me know on Twitter or Facebook what you like to shop for at thrift stores during back to school season. ← Welcome to the Everyday Thrifter!